Instead of “After you. No, after you,” we have “Screw you!” as we walk by people who can’t see beyond their electronics. Got sidewalk rage? Take the quiz. IF RYAN PACKER could use one superpower, it would be the ability to effortlessly swivel his neck 360 degrees to see in all directions. During his 25-minute pedestrian commute from his Capitol Hill apartment to his job in Belltown, Packer would have ample opportunity to use it. Like now, as he’s approaching a three-way intersection that feels a lot like an open-water crossing. 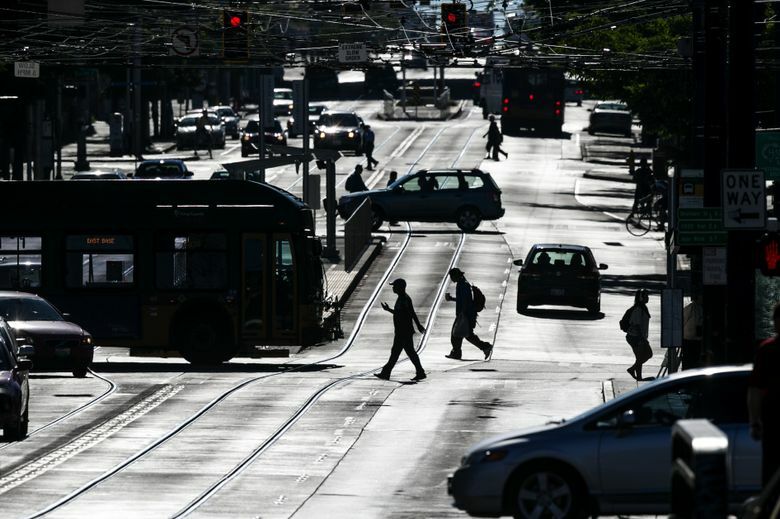 “I call this Public Enemy Number One,’’ the 28-year-old says, stepping into a confluence of roadways where Minor Avenue and Virginia Street join Denny Way. The roads have no crosswalks, and the huge turning field invites cars to cut in front of and behind pedestrians as they make their way along Denny. “If you’re anywhere in that space, they’re going to go around you,’’ says Packer, who has been making this trek for eight years. Sure enough, they do. About four minutes later, we’re standing on a corner that Packer calls Public Enemy Number Two: another three-way crossing on Denny, where pedestrians dodge traffic turning onto Boren Avenue. One car does stop on Denny to let pedestrians pass. This simple law-abiding act triggers rage in the driver of the next car in line, a gray BMW sedan. As three people cross the street on foot, the driver’s face congeals in disgust. She talks to herself for the full 15 seconds it takes for the crosswalk to clear, and, at the first sign of an opening, zips into the intersection, shaking her head disapprovingly with enough force to bounce her hair around her shoulders. By the time we reach Belltown, where Packer works as a data analyst for Zeeks Pizza, we have witnessed a close call in a crosswalk between two pedestrians and a van. We unintentionally walked through a “Sidewalk Closed” zone with a detour that would have taken us three blocks out of our way. We watched pedestrians spill into car lanes on a busy street to avoid knocking into each other in the crosswalk, and marveled at the body contortions and neck craning exercised by walkers trying to safely cross Fifth Avenue under the monorail. We’ve also spent almost as much time waiting for “Walk” signals as we did walking. One website devoted to walkable neighborhoods calls the most nerve-wracking part of Packer’s journey — the belly of the beast known as South Lake Union — a “walker’s paradise.” While it’s true there are many things to walk to there, the journey is akin to living in a dystopic video game where players score points for ramming pedestrians and blocking each other’s passage. It’s enough to leave you pining for the days when walking through downtown could be done efficiently, even serenely. Now, sidewalk closures and growing numbers of cars and people require the hyper-vigilance of a rat navigating a maze with ever-changing walls. 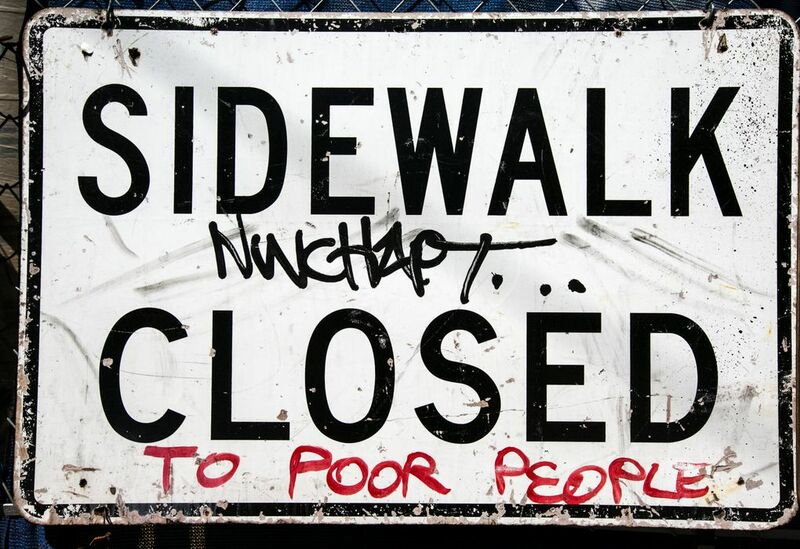 Yeah, we know other cities have it worse (New York, anyone?). But this is our jungle, and unless we all get on the same page, the expected influx of another 120,000 people in the next 20 years is going to ratchet up tensions even more. REMEMBER 2007, WHEN the discussion around sidewalks in Seattle centered on the neighborhoods that didn’t have them? Then-Mayor Greg Nickels made a big show of walking through those areas and staging news conferences with ribbon-cuttings to showcase the ones that did get built, even if they dead-ended 150 feet away into grass around the corner. The mere act of pouring concrete was enough to get people’s attention. Now, we have to remind people how to walk on them. Steroidal development — there are 49 projects under construction downtown with more to come — has shut down sidewalks by the dozens, even as thousands more people pack onto them daily for work and play. 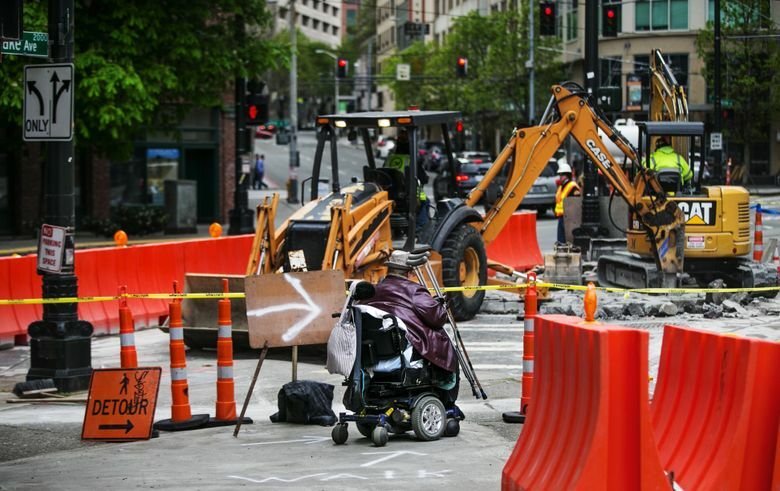 The Seattle Department of Transportation says it requires walk-through scaffolding or Jersey barriers — concrete or plastic modules that can be strung together — to keep sidewalks open during construction. But detours are more common. That’s because the department allows contractors to shut down sidewalks if they need to store materials on them or use them for construction work, such as loading and unloading. In South Lake Union, which has been taken over by the lanyard-wearing masses at Amazon.com, the area’s industrial past lives on through its now-dysfunctional streets that were designed for the passage of trucks and cars, not people. That area, along with Capitol Hill, Northgate and the University District, are expected to absorb most of the newcomers. The influx of humanity isn’t just a numbers problem, though. Equally significant is the obliviousness of our fellow pedestrians who amble (shamble?) along the sidewalks head down, eyes glued to electronic devices, bumping into anyone too stubborn or too glued to their own device to clear a path. 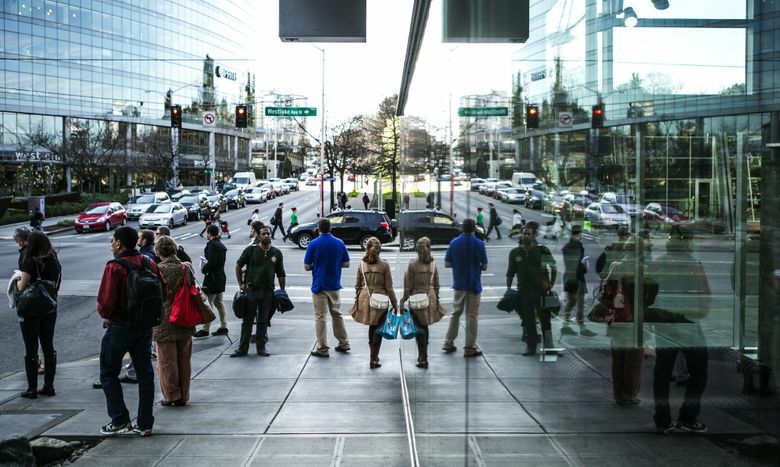 In South Lake Union, Packer calls them “Amazombies” — employees of the tech giant who walk five abreast as if they’re still on a college campus and have never seen a car or shared a sidewalk. Even people who work at Amazon get frustrated. Seattle used to be the land of the obedient pedestrian, a place where jaywalking was taken seriously by authorities and people on the street. The city, however, has turned its attention elsewhere. In 2009, the department wrote 480 tickets for jaywalking-related offenses, according to Seattle Municipal Court data. In 2013, the most recent year for which statistics are available, the number of citations was 185, a 61 percent drop. Maybe that’s why it’s common to see people step off the curb to cross midstreet, even on busy roads such as Denny Way. There are vestiges of old obedient Seattle. Recall the civic pride in 2014 when viral videos showed Super Bowl revelers clearing the intersections when the “Don’t Walk” signs flashed? But that Seattle is fading fast in the rearview mirror. Instead of “After you. No, after you,” we have “Screw you!” as we encounter people who can’t see beyond their own electronics. Sidewalks here still deliver on serendipitous encounters. They are places where you can glimpse love in its blooming stage, watch a Real Change newspaper vendor boogie down for four hours straight, or hear dialects from around the world. And sidewalks are unparalleled for in-your-face protest and political statements such as the beautifully staged bedroom that appeared one day on the sidewalk under the Interstate 5 underpass at South Dearborn Street, just south of the Nickelsville homeless encampment. 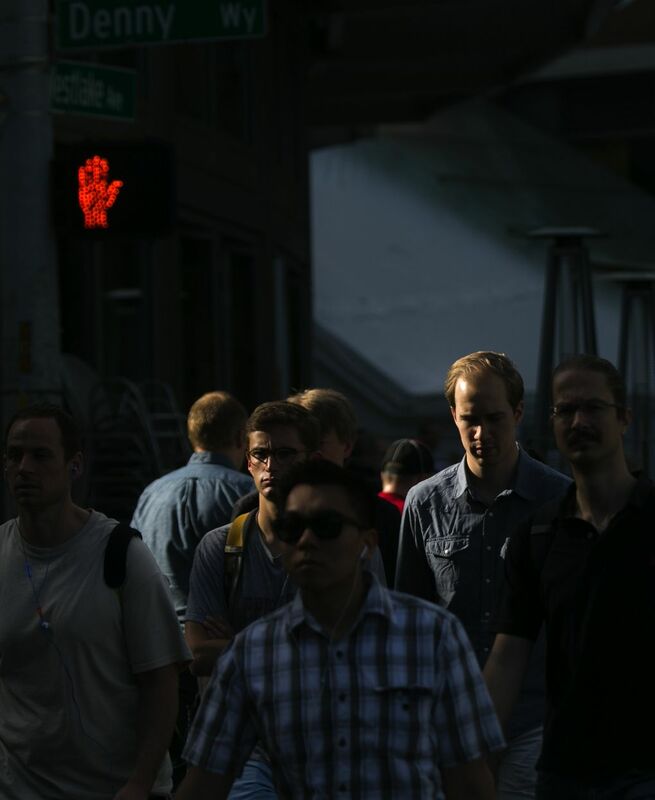 Walking makes you think, about your surroundings and about other people. In its best form, it brings you out of yourself, challenges your comfort zone, exposes you to tender mercies and reaffirms your humanity. Increasingly, though, sidewalks are places for disconnection and aggravation, places where the act of passage is an exercise in entitlement. AT LEAST ONE expert says that getting along in the new Seattle might require nothing short of a re-education. 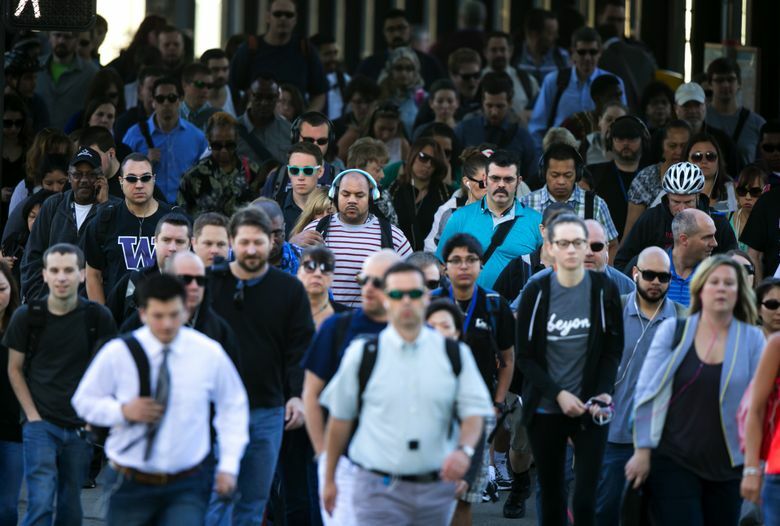 “This is a new phenomenon,’’ says professor Leon James, who teaches psychology at the University of Hawaii and has become an expert on all manner of rages associated with mobility. Air rage? Check. Road rage. Check. Pedestrian rage? That’s right. The same nasty impulses displayed at the crosswalk by the BMW driver during Packer’s stressful walk to work are showing up on sidewalks around the country. James’ research from a decade ago — when smartphones were starting to proliferate — showed that “most people carry on a stream of invective and hostile statements about other pedestrians” when they’re walking. He calls this quiet seething “mental venting,” and even came up with a name for it: Pedestrian Aggressiveness Syndrome. People did stupid things when cars were introduced to America’s streets, James says, but three or four generations later, we’ve pretty well adjusted to the dials and distractions. The rules have been agreed to, and uniform signs remind of us that driving on public streets is a privilege with limits. The same needs to happen with walking, he says. I laugh. But he’s not joking. Walking with awareness of others is a learned behavior that requires empathy, James says. Think of an elementary school letting out; until kids learn how to line up and wait their turn, chaos reigns. Impose some rules — no pushing, wait your turn, give some space — and you control the chaos, he says. In one paper, titled “The Psychology of Sidewalk Rage: A Community Crisis in the Making,” James writes, “Walking is not just getting from one place to another. A pedestrian does not just move through physical space, but at the same time through social space and mental space.” Someone who stops suddenly on the sidewalk to check their texts is violating a social contract that has been silently mapped out. And that messes with people’s heads, he says. The walk becomes stressful and unhealthy, he says. Violence associated with sidewalk rage, he says, is not yet common. But until people wake up to the inconvenience and distress they’re causing others, pedestrian rage could become as common as its road rage cousin, James says. SALLY MIKULAS-SERLETTI is cruising so fast in her motorized wheelchair it’s hard to keep up. Mikulas-Serletti, a costume designer and seamstress for burlesque performers, used to work as a permit specialist for the Seattle Department of Transportation, a job that put her in the position of spotting troublesome connections that would stop a disabled person in their tracks. 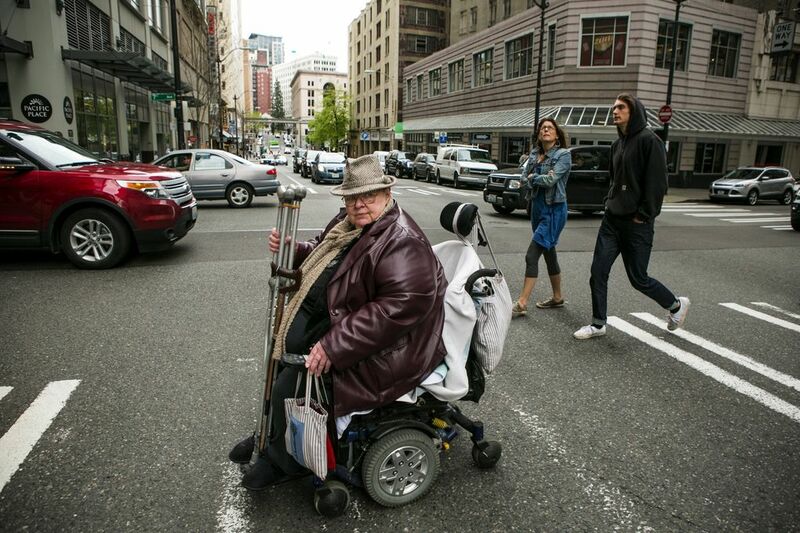 “The city really does make a strong effort to make sure everything is accessible,’’ she says. She gives the city high marks for mobility, even as she acknowledges that ongoing development downtown has forced changes to her lifestyle. “I quit going to massage school to get massages because it’s just too dangerous,” says Mikulas-Serletti, who retired in 2009. On a recent day, she effortlessly navigates a construction detour that takes her into the middle of a downtown street before looping her back into the crosswalk. The noise from a jackhammer and assorted construction equipment is deafening. To keep cruising, Mikulas-Serletti needs a relatively flat surface; any misalignment of more than 1½ to 1¾ inches will block her progress. She tends to steer clear of older neighborhoods where sidewalks are misaligned or broken from tree roots. Others’ neglect has made her world smaller. Still, she takes the long view when it comes to the hassles of navigating a growing city. Don’t fill the width of the path when walking in groups. Don’t step on people’s heels. Don’t stand in the middle of the path. See? Simple. Now we just have to figure out how to get the word out to the 120,000 newcomers. Susan Kelleher is a Pacific NW magazine staff writer. Reach her at skelleher@seattletimes.com or 206-464-2508. On Twitter @SusanKelleher. Bettina Hansen is a Seattle Times staff photographer.